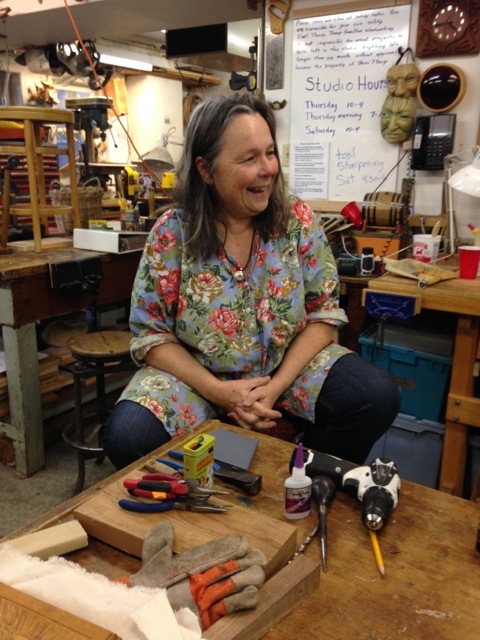 Last week, Karen LeGault, art camp director and a painting teacher for many years, and I had a chance to sit down with woodcarving instructor Sheri Tharp in her sunny Berkeley studio. 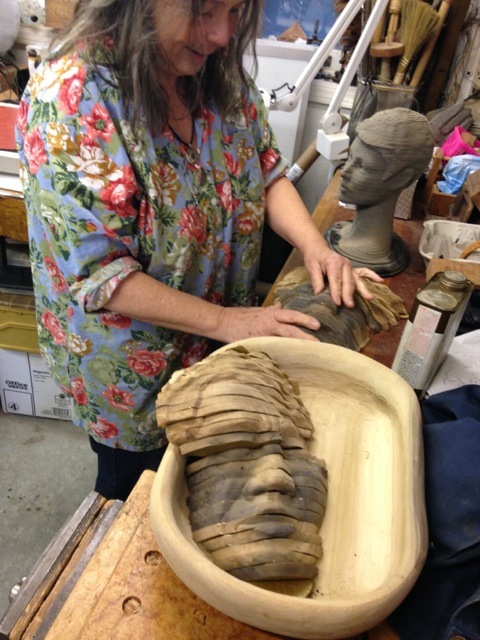 Sheri is offering a Woodcarving class at Art Camp this year. As you enter through the kitchen, you are greeted by intricately carved wooden masks, all having strikingly human expressions. 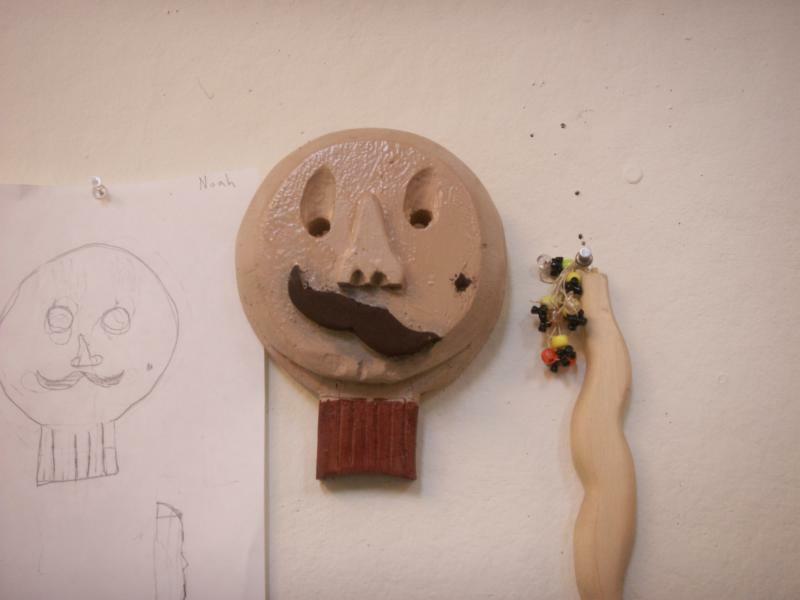 Once in the studio, we sit down at a long, wooden work table, surrounded by metal tools, saws, and a mix of Sheri’s and students’ work. 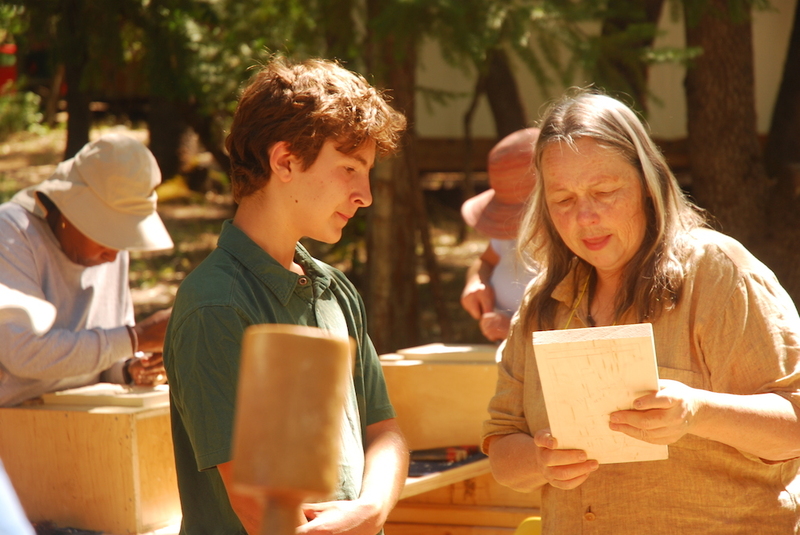 A: What would be your advice to people new to woodworking? S: I think anybody can do it. You just have to want to do it. I’ve been teaching for over 30 years and during that time there’s only been two or three people I felt I couldn’t teach. One of them was a professor of Physical Education and you could tell that she had always been physically successful. 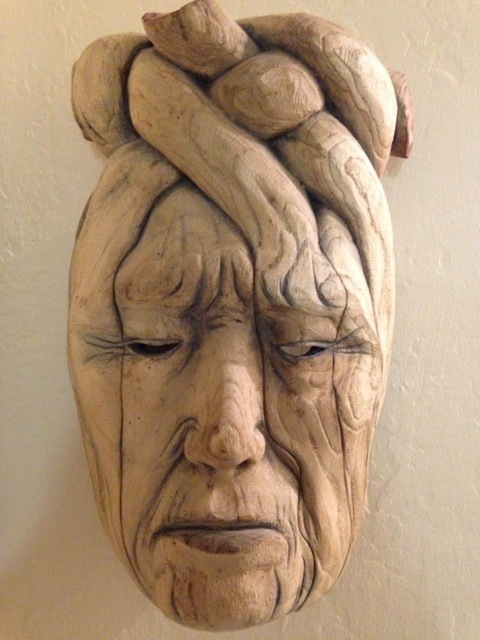 So, she starts woodcarving and it didn’t match what she had in her head. I kept saying, “No, that’s exactly what it’s supposed to look like.” I mean she was practically in tears! And she quit. K: You know it’s like that with drawing, too. Getting people to recognize that the act itself is part of the process. Sometimes the things that turn out, when you look back on them later, are actually better than what you expected, just not what you expected. S: You have to have a certain amount of blind faith when you are learning a new skill because you don’t know how to get to where you want to go until you’ve been there once. Sometimes I can tell people what’s going to happen. But some things you can’t explain; they just have to experience them. K: So you try to put them into the situation where the optimal chance of having that experience will occur. S: I always tell people that their job is to make mistakes, because that is the only way you can find out where the limit is. You have to go over the limit. That’s the only way. Otherwise, you’re always trying to sneak up to it. Until you go over, you never know where that line is. K: It’s a requirement of learning to go beyond, so you can figure out where to stop. 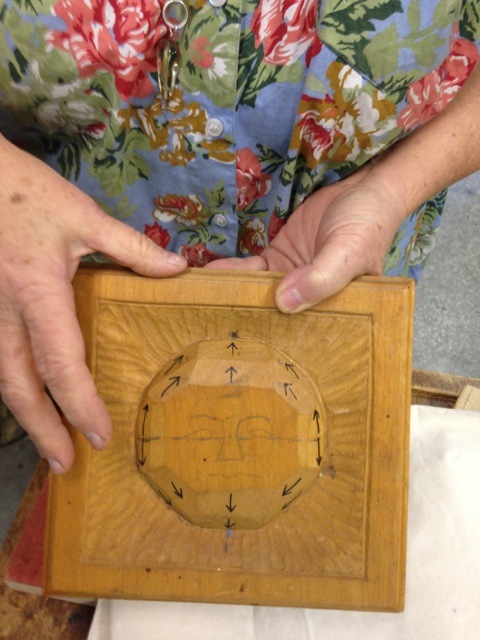 S: And part of it is getting the mind and the body to sync. Because intellectually­ – I know for me that’s what happened with tool sharpening – intellectually I knew what to do and I was going through the motions. I knew what I was supposed to do and all of a sudden, I was like, “Oh, okay. This is what it’s supposed feel like and this is what’s supposed to happen.” And this was after hours and hours of doing something over and over again and feeling like it’s not quite right. You just have to have faith it will happen. K: -something that’s a direction that you end up going in. S: And when you have a flat piece of wood like this, and then you have the carved leaves and grapes, it’s really hard to know how to make that out of this flat piece of wood. And I can tell you the steps, but until you’ve done it, you don’t really understand it. A: That leads me to the next question, Can you describe your creative process? S: I have two creative processes. One when I’m doing my own work, and the other when I’m working with students. I value them both equally, but they’re very different. With my own work, the creative process is very random. You go here, you go there and you push yourself. When I’m working with students, it’s much more what I like to call brainstorming. Think of it like creative ping pong. I’ll toss an idea onto the table and the other person bats it back. You bat this thing back and forth and sometimes the ball falls off the table and goes into the air, and you think, “Whoa! Everything’s over here! It’s not on the table at all!” Sometimes you need to see something differently. Like when you see something from across the room versus when you’re right in front of it. K: I was going to meet with a friend of mine this morning to start a series of discussions about engineering and art and creativity. And we had to cancel, and now we’re having this discussion! note: Anne Merkelson has more than 20 years combined experience in B2B marketing, social media, higher education marketing, event management and publishing.